for Fire / Rescue Agencies. CrewSense interfaces with the best RMS & CAD systems! Automate your overtime shifts with an intelligent, rules-based system. Designed from the ground up as a powerful, flexible and easy to use employee resource management solution, such daily headaches like complex scheduling and resource management can now quickly be solved with the CrewSense system. Filling open positions for outages and disasters is now a simple process that takes mere minutes. Alert all of your employees that match qualification – quickly – and watch in real time as your employees respond to the system. Turning a labor intensive task into a simple endeavor. Eliminate grievances with rules-based Overtime & Shift CallBacks. Save manager time and ensure fairness and equitability with your overtime distribution. The stand-alone ‘CallBack’ module works alongside, or independent of the CrewSense intelligence feature; giving you total control of your overtime hiring needs. Filling open shifts or performing crew call-outs is now a simple task. Employees establish their preferred notification preference for open shifts; either text (SMS) Message, Alpha-Page, Phone Calls or mobile App ‘push notifications’ and are alerted of overtime shifts in real time. Determine tie-breaker rules, place employees in multiple rotating lists, and more. The rules and configurations are endless. Multiple schedule views allows quick access to your Department schedule. Simple drag and drop capability allow you to schedule and line our your days with ease. Quickly deploy 'Strike Team' rosters for long term deployments and more. Thoughtful design and consideration to user experience has made CrewSense the software of choice for Fire Departments large and small. Quickly 'Hover to discover' over employee name to view all pertinent shift & employee information with ease. 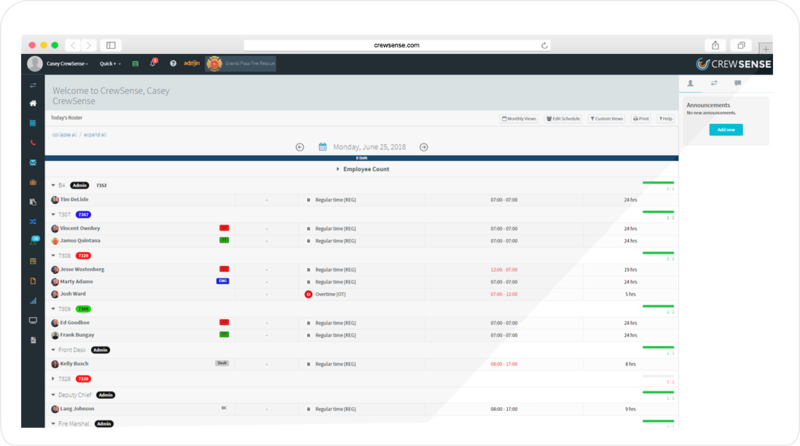 Never before has Fire Department scheduling & resource management been so easy. Detailed record logs are kept for every ‘CallBack’, allowing employees to quickly see their rankings, responses, notification methods, etc! Employee start and end positions are also shown, allowing employees to quickly determine why they were or werent offered extra work shifts. A Transparent checks and balance system allows both employees and managers to view previous CallBack opportunities; listing important factors such as: Employees contacted, their responses, contact methods, starting ‘rank’, ending ‘rank’ and more! Detailed logs are kept for every ‘CallBack’, allowing employees to quickly see their rankings and where they ‘sit’ in the system. 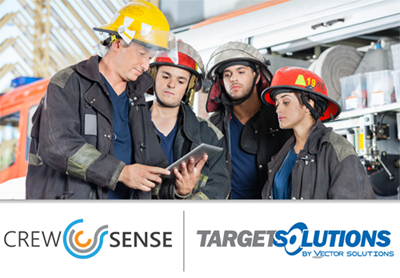 TargetSolutions delivers the premier online training management system for public safety agencies. The web-based software features a cutting-edge Learning Management System (LMS) with more than 450 hours of fire department training courses, including more than 250 hours of Fire and EMS continuing education to efficiently comply with mandated requirements. The Records Management System (RMS) tracks EMS credentials, so departments can easily determine what training is needed to remain in compliance. With TargetSolutions agencies can track ISO training hours, driver’s licenses, and all types of inspections. In total, TargetSolutions’ online catalog features more than 2,500 online courses, including NFPA 1001, NFPA 1021, NFPA 1500, NFPA 1410, Wildland Firefighting, and Emergency Response to Terrorism. TargetSolutions Check It™ operations management software streamlines routine maintenance inspections of trucks, tools, medical supplies, drugs, and other items logged in inventory records.